Successfully Added Innokin iTaste EZ.TC Vape Mod Kit - Temperature Control, 1500mAh, 2ML, Dry Hit Protection, 50 Watt, Adjustable Airflow (Black) to your Shopping Cart. The Innokin iTaste EZ.TC is a beautiful little starter kit for all smokers out there that wish to leave behind harmful tobacco products and enter the healthier and tastier world of vaping. This starter vape mod kit features a durable and compact design, letting you carry it along at any time and allowing you to take a relaxing vape whenever needed. 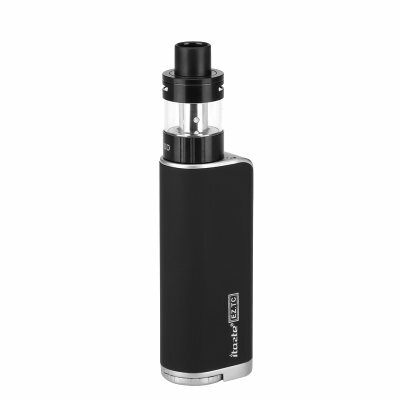 With a 1500mAh battery, you can be assured that this electronic cigarette brings along enough power to enjoy countless of vaping sessions on one go – assuring that you’ll never run out of juice in the middle of a relaxing vape. Featuring an adjustable power output between 7 and 50 Watt, the Innokin iTaste EZ.TC packs plenty of power which makes this E-cigarette perfect for starters and experienced vapers alike. Besides its adjustable Wattage, this electronic cigarette furthermore features adjustable temperature control with which you can manually adjust the amount of taste and vapor created while enjoying all the benefits this vape mod kit has to offer. With a resistance of 0.2 to 0.8-Ohm, you can be assured that the Innokin iTaste EZ.TC produces exceptionally large vapor clouds, allowing you not only to enjoy a tasteful vape, but also to impress all your friends and people standing by with your amazing vaping skills. With its 2ML tank, this electronic cigarette offers plenty of storage for all your favorite tasting e-juice. Simply pour in the liquid of your liking and you’ll be ready to vape the day away and enjoy countless hours of relaxing vaping. Thanks to the fact that this remarkable vape mod kit keeps plenty of your favorite juice and allows you to manually adjust your Wattage and temperature, the Innokin iTaste EZ.TC lets you adjust your upcoming vaping sessions to your exact personal liking – assuring that you’ll be able to take the absolute most out of this beautiful electronic cigarette. Coming with an abundance of safety features that include but are not limited too dry hit protection, low voltage protection, short circuit protection, and reserve battery protection, this E-cigarette is guaranteed to bring along a pleasant and safe vape experience – making it the perfect device for all beginning vapers out there. Whether you’re an advanced vaper or new to the industry, the Innokin iTaste EZ.TC bring along a great vape experience that is sure to meet the likings of all vapers out there. The Innokin iTaste EZ.TC comes with a 12 months warranty, brought to you by the leader in electronic devices as well as wholesale electronic gadgets..